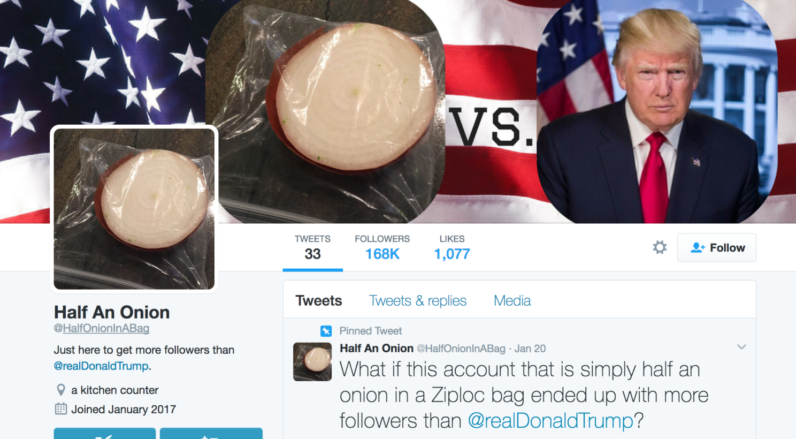 Donald Trump's newest Twitter rival is... an onion in a bag? Donald Trump’s newest Twitter rival is… an onion in a bag? The account came out of the gates strong, receiving huge engagement numbers in its fairly short posting history. Ambition, though, is what this onion does best. The account started with a singular goal of besting President Trump and his 21.7 million Twitter followers. Its mission — if completed — would certainly bring tears to the eyes of our notoriously thin-skinned President — a man famous for rants about everything from television ratings for his own show ‘The Apprentice” to how unfunny Saturday night mainstay SNL has become.